Eighty years ago this month, four times the normal amount of rainfall fell in the Ohio River Valley. Louisville, Kentucky endured 19 inches of rain, 15 of them in just 12 days. On January 27, the swollen Ohio River crested at 57.1 feet above flood stage, marking the peak of what has been called the worst natural disaster in the city’s history: the Great Flood of 1937. 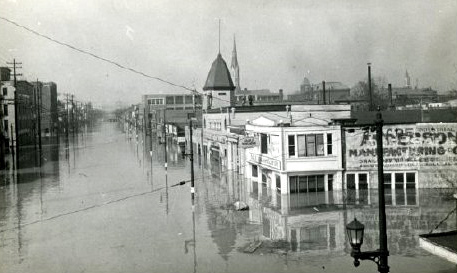 Before the water receded, 70% of Louisville was submerged, 230,000 citizens were displaced, and as many as 200 were dead. The Manuscripts & Folklife Archives of WKU’s Department of Library Special Collections holds numerous letters, diaries and recollections telling of the Great Flood and its impact on the region. To name just a few of the eyewitnesses: Alice Stout at the Cortlandt Hotel, who wrote her mother of the growing emergency as city services–water, gas and electricity–began to shut down; Edna Grauman, who wrote in anguish to WKU librarian Margie Helm of the herculean efforts to salvage the collections at the Louisville Public Library; Margie Helm’s sister-in-law Kitty Helm, who wrote of the flow of refugees to schools and churches, and of helping doctors administer typhoid shots amid fears of a public health crisis; volunteers like Mary Leiper Moore, who came from Bowling Green to help with relief efforts and evacuate refugees; and Arthur Lissauer, who earned a commendation for his work ferrying victims to safety. Sunday morning, January 24: “Louisville is in an awful condition.” Joiner was glued to the radio as WHAS began broadcasting continuous flood reports and directing rescuers to people trapped and in danger of drowning. As the flood overwhelmed the city’s infrastructure, the supply of electricity, gas and drinkable water was in jeopardy. Sunday evening: Still raining, with more to come. The river was rising one foot per hour. The sanatorium, located on high ground, was safe for the time being, Joiner reported, but the lights had gone out and there was talk of rationing food. Monday afternoon, January 25: The river was at 55 feet and rising. Joiner had no heat or light and, though surrounded by this historic flood, little water to drink or bathe in. Tuesday morning, January 26: Joiner heard cars running all night, some delivering refugees to the sanatorium, and planes flying overhead delivering supplies. The lights were still out. Wednesday morning, January 27: At 57 feet, the river was now 10.5 feet higher than it had ever been. Joiner could see flooded homes in the valley below. Rumors abounded of deaths, shortages of coffins, and no dry place to bury the dead. Friday morning, January 29: The water was beginning to recede, but the sanatorium still had no lights, little water, and only enough food for two meals a day. Joiner, who hadn’t bathed in nine days, lamented the fact that two dozen patients were using the same toilet but flushes were limited to three or four a day. 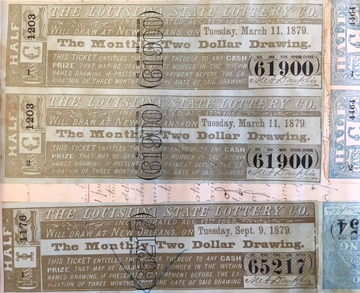 “The only cheerful thing about the whole dreadful thing,” wrote Kitty Helm of the Great Flood, “is the discovery of an amazing amount of kindness and generosity” in the rescue efforts and the aid extended by Kentuckians as far away as Bowling Green. Even the U.S. Mail rose to the occasion: Kitty’s letter, mailed on January 26, had been delivered on January 29 despite lack of sufficient postage. Click on the links to access finding aids for these collections. For more collections giving first-hand accounts of the Great Flood of 1937, search TopSCHOLAR and KenCat. As the Colorado rainwaters recede, we remember that Kentuckians are no strangers to floods. One of the worst occurred early in 1937, when record rainfall swelled the Ohio River from Pennsylvania to Illinois. 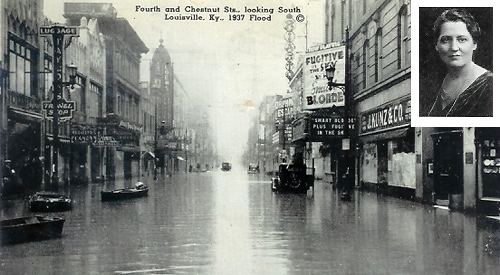 Louisville, Kentucky, where the river eventually crested at 57 feet above flood stage, was one of many communities to suffer severe damage. 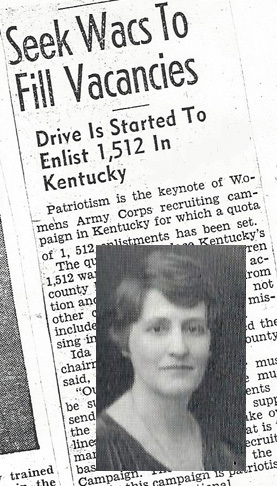 In the face of the growing disaster, Mary Taylor Leiper (1885-1973), a librarian at WKU, left Bowling Green with a motorcade of about 200 other cars to help evacuate Louisville residents made homeless by the flood. In a letter to President Henry Hardin Cherry’s wife Bess, she vividly described what she encountered. Arriving in Louisville, she was directed to a spot at the water’s edge where rescue workers pulled up in a boat and deposited in her car an 84-year-old man and his nurse. Clutching his little Boston bulldog, the man was grateful for having survived three days in a house surrounded by water–and, Leiper’s nose told her, more than a week without a bath. Leiper witnessed the grim conditions in the refugee centers: no heat or light, little water, and “shanties” set up in the middle of the street and connected to sewer lines to serve as toilets. Finally, she set out for Bowling Green carrying “four lovely people,” a couple and their grown son and daughter. At the end of the four-hour drive, Leiper took them to a church for food and coffee, then to the Armory for beds, the gymnasium at WKU having already been filled to capacity. As she was leaving, Leiper described running into four other refugees, “old maid sisters” who, despite the circumstances, proved to be “the most attractive and interesting people” she had met in a long time. She put them up in her own house for the next two days, where the women related harrowing stories of moving from place to place as the flood waters rose. But they also made their hostess laugh as they told of watching two soldiers struggle to lift a 325-lb. woman into a truck, and of agreeing that if “Christ was not too good to be born in a manger,” then surely they could accept transportation in a railroad boxcar. “I can never tell of the joy that we all got during the time these women were with me,” Leiper wrote, marveling at their courage and sense of humor. Mary Leiper’s letter is available in the Manuscripts & Folklife Archives section of WKU’s Special Collections Library. Click here to access a finding aid. 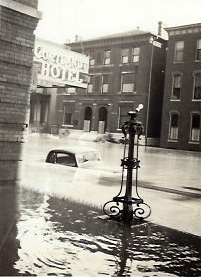 For more on the Ohio River flood of 1937 and other Kentucky floods, search TopSCHOLAR and KenCat.